At least Shermy had the decency to keep his insults behind Charlie Brown’s back. Most of the kids in Charlie Brown’s circle of not particularly friendly friends didn’t even disguise their scorn. They mock, dismiss, and yell at him, pulling away the football and finding new ways to taunt him each time he lands. For some, this is how the strip is remembered, as an anthology of defeat and depression, a reputation that was fanned by the 2007 biography Schulz And Peanuts, which cast Schulz as a bitter man who channeled his unhappiness directly onto the page. But that reading ignores how tender the strip could also be. This was, after all, the same widely beloved kids’ cartoon that was spun off into an empire of Hallmark cards, stuffed animals, and holiday specials. If it had been solely about the suffering of a bullied child it never would have had that kind of reach. Melancholy may have come easily to Schulz, but he was equally gifted at capturing the wonders and small joys of childhood, and no character embodied Peanuts’ warm side better than Snoopy, the cuddly beagle who quickly became the strip’s mascot. While Schulz took a deeply cynical view of interpersonal relationships, he was often downright sentimental about the bond between a boy and his dog. On the surface, Charlie Brown’s dog could be just as stubborn and demanding as the strip’s bossy children. A recurring joke has Snoopy finding new ways to antagonize his owner into feeding him; another has Charlie Brown responding to Snoopy’s antics by wondering why he can’t have an ordinary dog. Anybody who has ever had a dog can relate, since every dog owner believes their pet is weirder and wackier than it really is. But unlike the peers who test Charlie Brown, Snoopy offers him something invaluable in return: loyalty. “Why does a person own a dog?” Charlie Brown asks Linus in an early ’70s strip. “For the security of knowing that there’s a least one creature in the world who likes you,” Linus responds. And indeed, Snoopy is the one character who openly loves Charlie Brown. The strip frequently has the two greeting each other with enthusiastic hugs, and several of its dramatic arcs find the two separated then happily reunited. Few comics have so perfectly captured the mutual joy that a pet and his owner bring each other. In these strips, Snoopy serves as a sort of karmic reward for all the indignities life hurls at Charlie Brown—if he’s got to be miserable, he should at least have a dog at his side. 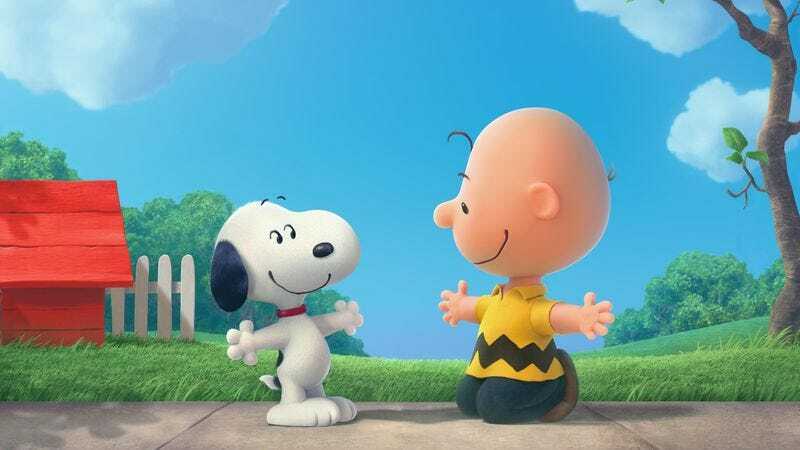 One of the comic’s animated specials, Snoopy, Come Home!, underscores the role Snoopy plays in Charlie Brown’s life by inventing an origin story for him: Charlie Brown’s parents gave him the beagle to comfort him after a bully dumps sand on his head. “A dog’s life is a lonely life,” he sighs. “Cats hate us. Horses step on us. Wild animals despise us.” He finds comfort by hugging his perplexed owner. With strips like these, Schulz dared to suggest that Charlie Brown, the world’s whipping boy, and Snoopy, the popular dog on all those T-shirts, were kindred spirits, each struggling to reconcile their lot in life. It’s the closest the comic ever came to closure. Charlie Brown would never kick the football. He’d never evade the kite-eating tree or take his baseball team to the championships, and he was almost certainly in store for more heartbreak. But throughout it all, he had a companion, and that made the pain go down a little easier.